Dreaming of a breathtaking landscape and making it a reality are two different things. Success requires a well-rounded expertise in design, agriculture and business practices. There is no better way to increase the value of your business or home than with landscaping and effective tree management. At L and T Tree Service our certified landscapers work with you to resolve problem areas and design an outdoor environment that is right for you. Each project is approached with the individual client in mind to meet your needs and wishes. The landscape surrounding your company�s property represents the impression that you want to appear to the people that see it every day. Our goal is to provide the most experienced and established landscape design and support services in the greater Irving area. Our fully licensed and insured company has grown into a large full-service organization that offers an extremely wide range of services. Many of our customers have been with us for more than 10 years and find that the personal touch we offer is the key to our success. 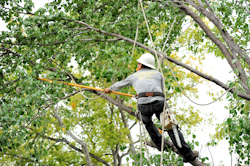 We are equipped with the latest equipment, and experienced employees to make your tree pruning or removals safe. We strive for excellence in all areas always working closely with the customer to make sure your dreams are realized. Look around and see samples of work we have done in recent years. 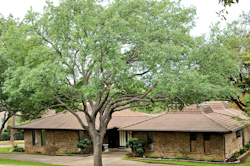 L & T Landscaping & Tree Service can offer plenty of landscaping services. At L & T Tree Service we also specialize in emergency and difficult tree removal. If you are hit by a major storm or the old tree between your house and the neighbors starts to fall down give us a call. 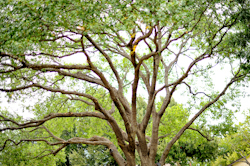 Our experts will carefully remove the tree without causing any unnecessary damage to your property. Call us 24 hours a day 7 days a week if you have an emergency. Click the picture about to view us removing a difficult old tree between two houses.